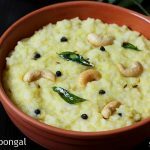 Ven pongal recipe – Pongal is a popular South Indian food prepared with rice & moong dal, either to a sweet or savory dish. 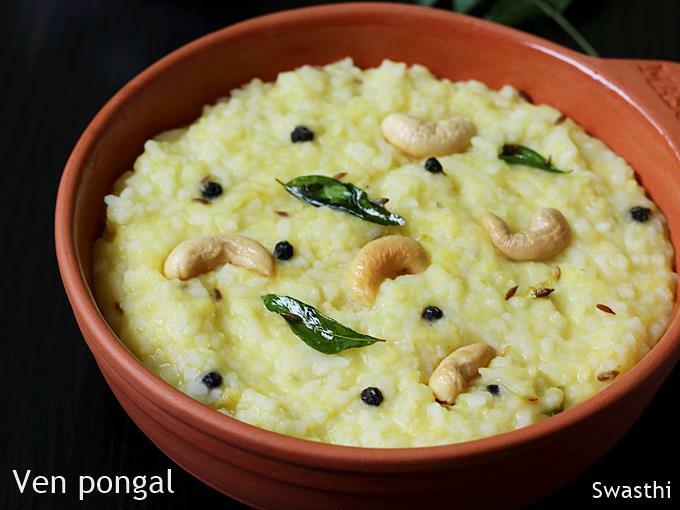 Ven pongal or khara pongal is the name given to the savory version. It is offered to the GODS or diety as naivedyam not only in South Indian homes but also in temples, during regular pooja, auspicious days & festivals. Both versions of pongal are offered to Godess Durga & Lakshmi during Navratri, Varalakshmi puja and even on regular days. Basically ven pongal is a south Indian version of the Dal khichdi. For many South Indians it is a comfort food as it is quick to prepare and is light on the stomach. It can be prepared quickly for breakfast, lunch or dinner. Pongal is protein packed, tastes delicious with a good aroma of ghee and seasoned ingredients. It takes less than 30 minutes to make along with a chutney. It tastes best when served hot or warm. This pongal recipe can be used to make a millet, oats or quinoa pongal. Just replace rice with millet or quinoa. The khara pongal recipe shared here is a traditional one, the way we make at home mostly to offer as naivedyam using cow’s ghee and a dash of turmeric for tempering. Cow’s ghee and turmeric are a must in most homes for savory naivedyams. You can also find a sweet version of pongali called as Sweet pongali here. 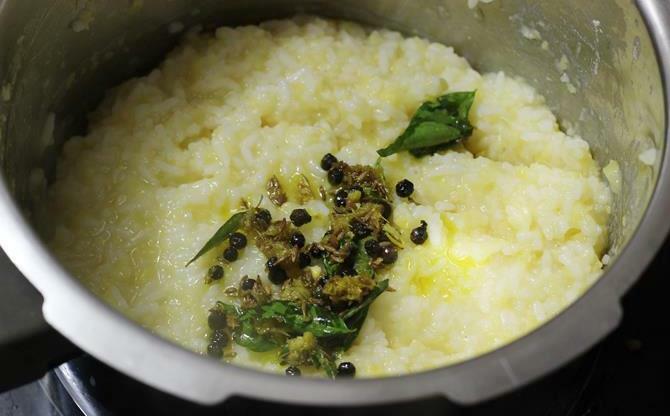 The key ingredients to make a good pongal are good quality ghee, curry leaves, pepper, ginger and hing. There are no substitutes to these ingredients and do not skip them. 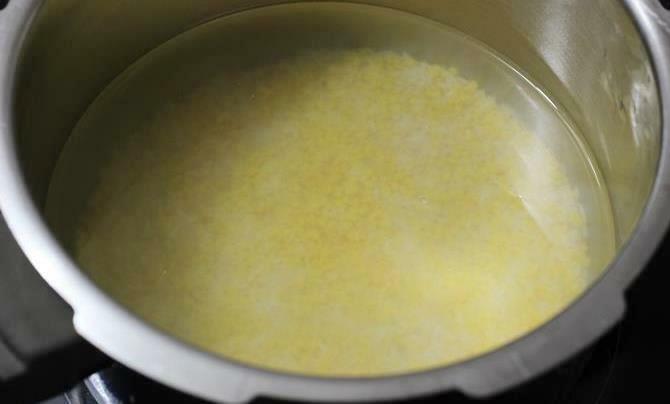 Do not skimp on the amount of ghee used in the recipe as it brings a whole lot of aroma to the dish. It also make the dish less sticky. The ratio of rice & dal is a personal choice. My mom always made pongal with equal amount of rice and dal so that we get enough protein in our diet. However you may reduce it if you prefer. We usually dry roast the moong dal good enough for a month, cool it and then store in a dry jar. This saves some time whenever you plan to make it. Khara pongal is usually made with short grain rice varieties that is locally grown in South India. So each home uses whatever they use for their regular cooking. Venn pongal is best served with coconut chutney, pickle or a south Indian tiffin sambar. Khara or ven pongal is a rice lentil dish that is often prepared in south Indian homes to offer to GODS during puja. It is also a comfort food and is made often to enjoy with sambar or chutney. Dry roast ½ cup dal on a low to medium flame till they begin to smell nice & aromatic. This step is optional however pongal gets a real aroma from the roasted dal. Add ½ cup rice and the roasted dal to a pot or cooker. Wash them at least three times. Drain the water completely. Pour 2½ to 3 cups water. Add salt. Cook the rice & dal to a soft texture. For pressure cooking: If cooking directly in the pressure cooker, then cook for 2 whistles on a medium flame. If cooking in a bowl, then place it in the cooker and pressure cook for 3 whistles. When the pressure releases naturally, open the lid. 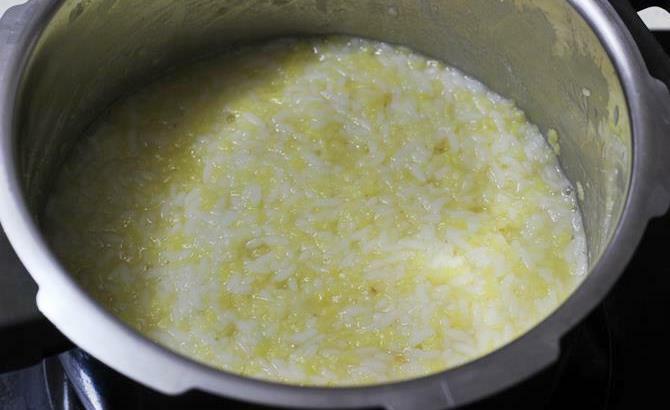 To cook in pot: You can also cook the rice & dal in a pot until soft & mushy. If you desire, you can mash up the cooked rice & dal a bit to get creamy consistency. 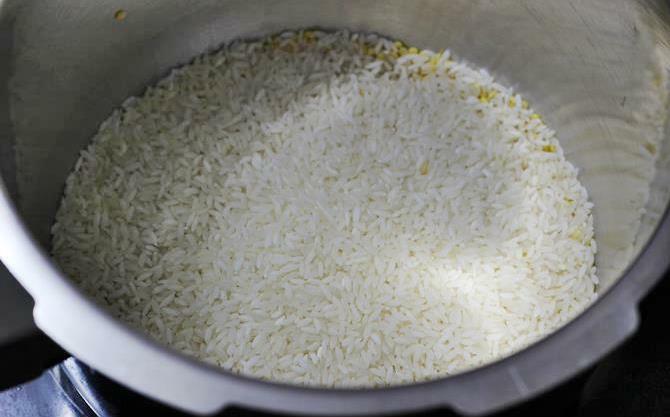 Let the water evaporate and the rice reach a mushy and creamy stage. It should not be very runny or dry. Add more salt if needed and stir. Heat a pan with ghee. Fry cashews till golden. Set aside. Add cumin & crushed pepper. Allow them to splutter then add chili, ginger and turmeric. Saute well until the tempering turns aromatic. Then add hing. Pour this to the cooked pongal. Mix and simmer for 1 to 2 minutes. Off the stove. 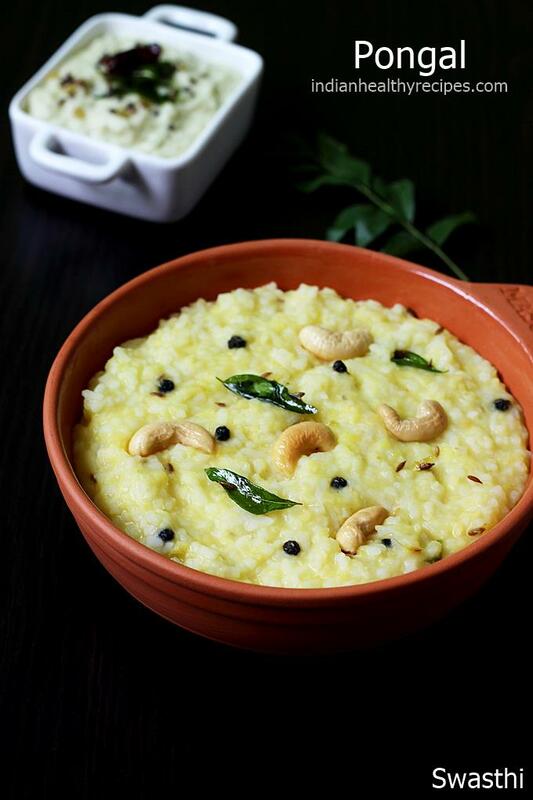 Serve ven pongal with coconut chutney or sambar. 1. You can substitute rice with brown rice, millets, steel cut oats or quinoa. you will have to soak them for at least 15 mins and then use in the recipe to reduce the cook time. Also use more water. 1. I usually use my stainless steel pressure cooker to cook most of my foods directly in it. However you can also make the pongal in a bowl by placing it in the cooker. If you do not own a cooker then just cook it in a pot. 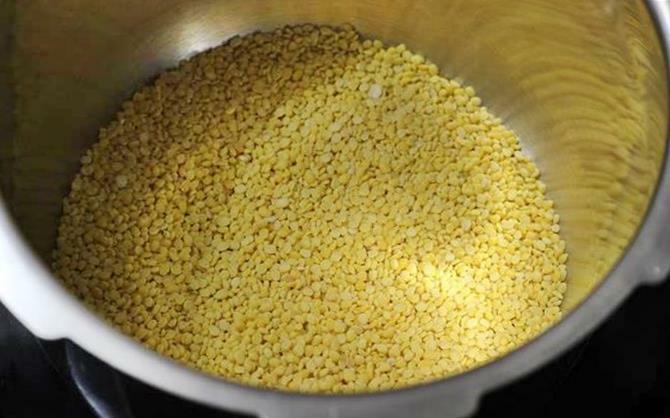 Heat a pressure cooker or pot and dry roast moong dal on a low to medium flame till aromatic. Keep stirring often to prevent the dal from burning. 2. Next add rice to the pot. Wash them very well a few times. If you are on a health spree, you may substitute half of the rice with brown rice. But will need to soak for at least 30 to 45 minutes to get a smooth pongal. 3. Pour 2½ to 3 cups water & add salt. Cook till soft. You can cook in a cooker or pot. 4. If cooking in a pressure cooker directly, cook on a low to medium flame for 2 whistles. Or For a pot in pot method you can place the bowl in the cooker and pressure cook for 3 whistles. When the pressure releases naturally open the lid and stir. Rice and dal should be cooked well to mushy. 5. 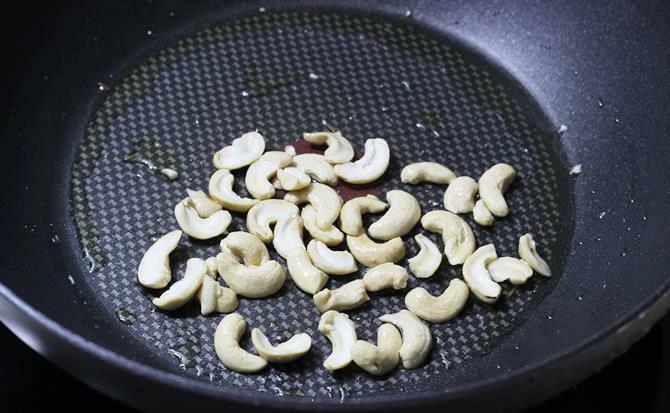 Heat a pan with ghee and fry nuts till golden. Remove them to a plate & set this aside. 6. In the same pan, saute ginger & chilies for 1 min. Then add cumin and crushed pepper corn. Saute until cumin sizzles. 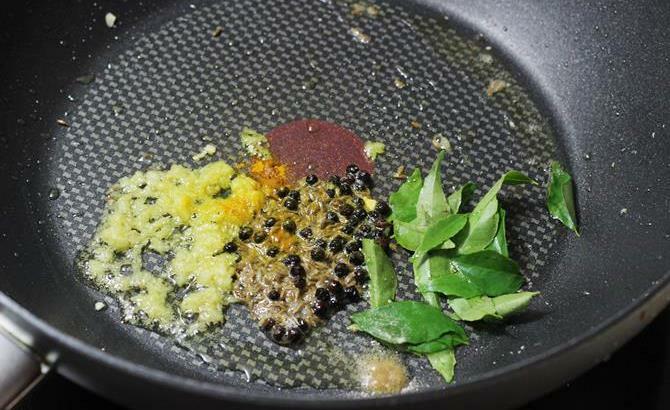 Add curry leaves, turmeric and a pinch of hing. When the leaves turn crisp & you begin to get a good aroma of the tempering, switch off. If not making for naivedyam, you can also use a slit green chili to add heat. 7. Transfer it to the cooked rice and dal. Simmer for a minute or two. Serve khara pongal with chutney. This is Kani, a Srilankan living in the USA. I try a lot of your recipes and they taste very awesome. I and my family love your healthy ideas like using oats and quinoa in this pongal. Thank you. Keep writing awesome recipes for us. You are welcome. Thanks for trying the recipes. Glad you liked them.Yes sure will keep sharing more recipes. Hi sis, Can v pongal using dosa rice? Can v make pongal using dosa rice? You are welcome. Will surely try out your tip of using coconut milk. Sounds good. Thank you so much!